It is not quite springtime without the delicious and nutritious asparagus. It is one of the most rewarding vegetables to grow yourself, and once you do, you’re likely to see an abundant asparagus crop year after year. If you’re looking for some asparagus gardening tips, you’re in the right place! Why should you grow asparagus? Asparagus is among the most nutrient-packed vegetables available that is high in vitamin K, vitamin A, vitamin C, and folate. As a result, asparagus health benefits include nourishing digestion, fighting cancer, managing blood sugar, and much more. The following article will help explain how to grow your own asparagus, where to find it when it’s not growing, and how to cook it. Asparagus is one tasty and versatile vegetable, and the provided springtime recipes will help you get the most from it. If you love asparagus, you may want to grow it yourself. Perennial plants like asparagus will grow in your garden each spring, and sometimes up to 30 consecutive years. However, patience is required as it may take two to three years before you receive your first crop. Asparagus will thrive in any area where the ground goes through dry seasons or freezes during the winter. It is important to note that it is difficult to grow asparagus in wet or mild areas. Asparagus is a monoecious plant, meaning both female and male organs can be found on the same specimen. Planting asparagus is a journey, and hopefully once is the only time you’ll need to plant the asparagus. How well the bed is prepared will determine the success of your asparagus plant for years. You will want to plant the asparagus in early spring, or as soon as the soil can be worked. Step 1: Eliminate all weeds from the bed, and work in a two to four-inch layer of compost or soil mix. Step 2: Dig trenches of about six inches wide, and six to 12 inches deep. Shallow six-inch trenches are ideal, according to some gardening pros. Step 3: Spread the asparagus crown plants 12 to 18 inches apart, and cover the roots and crowns with soil two inches deep, and water thoroughly. Step 4: When the stem grows, fill the trench with more soil, and leave about four inches of the stem exposed. Asparagus does not thrive in overly wet conditions, so be sure your asparagus bed is raised and it has a good drainage system. Step 5: When the trench is filled, water and add mulch regularly. The asparagus spears should not be harvested the first year. Instead, cut down the dead foliage in the late fall and put down more compost. In the second year, keep the bed thick with mulch and dress in compost in the spring and early fall, while cutting down the dead foliage in the late fall. As mentioned, it can take up to three growing seasons to harvest asparagus; however, you may be able to harvest a little in the second year. The first year allows the asparagus crown to get well established. In the next spring, you will remove old fern growth from the previous year, while keeping a look for the new spears to begin to grow. For the following years, maintain the asparagus bed and harvest only when the spears become thicker than a pencil. The asparagus harvest season will be for about two to three weeks once the spears begin to show. You must keep an eye on the asparagus, or you may miss the harvest. After harvesting, allow the ferns to grow as this replenishes the nutrients for the next year. You will need to cut the spears about six inches in length, and at an angle. Keep in mind that asparagus also freeze well, so you can keep it frozen throughout the summer and fall. Don’t worry if asparagus gardening is not your thing. Asparagus is fairly easy to find at the grocery store. In general, it is all right to buy conventional asparagus. Asparagus is featured on the Environmental Working Group’s Clean 15 list; therefore, it is a food with relatively few pesticides and overall low pesticide residue concentration. What should you look for when buying asparagus? Asparagus should be plump and straight. Signs of older asparagus include bunches that are split, dry, or with woody stems. Also, thin asparagus tend to be more sweet and tender, while fatter stems have a stronger flavor with a meaty texture. You can test the freshness of asparagus by making sure it snaps when bent. Asparagus should be used within a few days of buying, but it may be able to last a little longer if you grow and pick yourself with our asparagus gardening tips. It is best to store asparagus in a loose plastic bag in the refrigerator. When preparing your asparagus, cut the bottom inch, and wash the spears thoroughly. Although not necessary, peeling the first inch or two of coating with a vegetable peeler can improve the texture and taste of the asparagus. Next, dry the spears by rolling them between kitchen towels. Asparagus spears can be left whole, or cut into smaller pieces for salads or stir-fry dishes. There really are so many ways to cook asparagus. Steaming then roasting is a good method; however, others may enjoy grilling, boiling, sautéing, or poaching asparagus. Make sure that the asparagus is fork-tender when you cook it. Overcooked asparagus will taste mushy, while undercooked asparagus will be hard to chew. Do you want to have some variety to your asparagus recipes? Asparagus is perfect alone as a side dish or appetizer, but you can also add it to soft-boiled eggs, or feature it with salads. 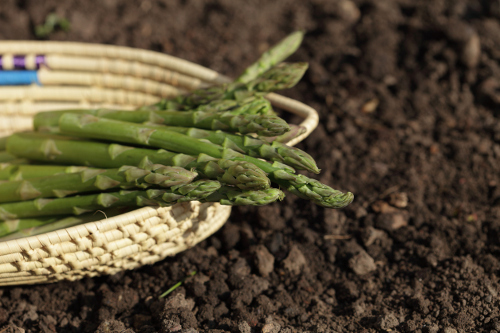 The following are a few recipes that are great for springtime asparagus gardening. For the carrots, preheat the oven to 350 F. In the medium bowl, combine the parsley, carrots, salt, and olive oil. Cook in the oven for 15 minutes; then, stir and cook for an additional 10 minutes. Let cool. For the asparagus, after washing, trimming, and peeling; place in a steamer attachment. Boil a medium pot of water, and once boiled, cook the asparagus for about eight minutes or until fork-tender. Once soft, place the asparagus in a glass baking dish, and combine with lime juice and choice herbs. Bake in the oven for 10 to 15 minutes, just to cook with the juice. To complete the salad, place a bed of arugula on the bottom, and top with the carrots and asparagus mixtures. Serve as a salad or a side. It makes about four servings. Preheat the oven to 350 F. In a large glass baking dish, toss the asparagus with the coconut oil, salt, and garlic. Bake until the asparagus is tender-crisp, for about 20 minutes. Stir gently at the 10- and 15-minute mark of cooking. Remove the baking dish from the oven and toss the asparagus with lemon juice. Adjust the salt and lemon, if necessary, and serve at room temperature. Add some lemon zest if preferred. You should get about eight sides with the recipe. Fill a pot with cold filtered water, add the salt, and bring to a boil. Reduce the heat to medium-high, and cook the sweet potatoes for 10 minutes, or until tender. Add the asparagus, and blanch for one minute. Strain the vegetables, and rinse with cold water. Spread out to dry on a clean kitchen towel. In a large skillet, sauté the onions in the oil for three minutes. Add the turmeric, cumin, garam masala, and mustard seeds. Cook until fragrant, and add the sweet potatoes and asparagus; gently toss until evenly coated. Cook for two minutes to heat through, and stir in the cilantro and lemon juice. Season with sea salt, and garnish with lemon zest. The recipe will yield four side servings. The nutrition profile of asparagus is truly impressive. For instance, a half cup of cooked asparagus contains over half the recommended daily amount of vitamin K, and nearly a third of the required amount of folate. It is also low in carbohydrates and fat, while containing some fiber and protein. Asparagus is also a good source of vitamin A, vitamin C, vitamin E, vitamin B1, vitamin B2, vitamin B3, vitamin B5, vitamin B6, choline, and betaine. Minerals in asparagus include calcium, iron, magnesium, phosphorus, potassium, zinc, copper, selenium, and manganese. The following is a comprehensive asparagus nutrition chart with information for a half-cup of cooked asparagus, or 90 grams of the vegetable. The nutrient-dense asparagus is loaded with health benefits. For instance, the high amount of vitamin K in asparagus helps support bone health and heart health. The antioxidant and anti-inflammatory properties of asparagus may help reduce the risk of various health concerns like cancer and type 2 diabetes. The significant amount of folate in asparagus also contributes to a healthy pregnancy. What makes asparagus the perfect vegetable choice for spring? Let’s take a look at the top three health benefits of asparagus that pertain especially for the springtime. According to a study published in the West Indian Medical Journal in 2010, asparagus can act as a natural diuretic. This is important because asparagus could potentially rid the body of excess salt and fluid, which is useful for people with high blood pressure and edema. Asparagus may also flush toxins from the kidney, and prevent kidney stones. However, people suffering from uric acid kidney stones should avoid asparagus. The glutathione in asparagus is a potent antioxidant compound that may also help detoxify the body and destroy carcinogens. Glutathione helps play a role in immune function and therefore may protect or fight certain cancers, such as colon, bone, lung, and breast cancers. Anti-inflammatory and antioxidant nutrients will play a major role in reducing chronic oxidative stress and persistent inflammation. Keeping the digestive system running smoothly is perfect year round; however, some may cleanse the digestive organs during the spring. Asparagus contains the insoluble fiber inulin, which is a prebiotic that passes through the large intestine undigested, where it is a good food source for the healthy gut bacteria. The good bacteria are necessary for proper nutrient absorption, strong immunity, and may lower the risk of several health problems like cancer and allergies. Although asparagus gardening isn’t for everyone this spring, the vegetable is a great nutrition source to have throughout the year. Asparagus is considered to safe to eat, but it may cause a reaction in those with a food intolerance or sensitivity to asparagus. It may also cause an allergic reaction in people sensitive to foods in Liliaceae family, such as leeks, onions, chives, and garlic. Allergic symptoms may include hives, runny nose, puffiness or swelling around the lips and mouth, and trouble breathing. Asparagus works like a diuretic or water pill, and eating large amounts may reduce how well the body eliminates lithium. Lithium affects the flow of sodium through muscles and nerve cells in the body. After eating asparagus, some people will have a strange smell in their urine. Asparagus is the only food to contain the chemical compound called asparagusic acid. When the chemical is digested, it breaks down into strong-smelling sulfur-containing compounds that are not absorbed by the body. Studies have found that 10% of about 300 people were able to smell the odor, suggesting the sensitivity to the smell may be genetic. Either way, there are no harmful effects to smelling or producing the urine odor. “Asparagus, cooked, boiled, drained, with salt Nutrition Facts & Calories,” SELFNUtritionData; http://nutritiondata.self.com/facts/vegetables-and-vegetable-products/2783/2, last accessed March 28, 2017. LaLiberte, K., “How to Grow Asparagus,” Gardeners; http://www.gardeners.com/how-to/growing-asparagus/7343.html, last accessed March 28, 2017. Daniluk, J., “Hot Detox: A 21-Day Anti-Inflammatory Program to Heal Your Gut and Cleanse Your Body (Toronto: HarperCollins Publishers Ltd., 2016), 218, 248. Szalay, J., “Asparagus: Health Benefits, Risk (Stinky Pee) & Nutrition Facts,” Live Science, Oct. 17, 2014; http://www.livescience.com/45295-asparagus-health.html. Groskopp, T., “4 Health Benefits of Asparagus and Why Your Pee Smells!” Natural Healthy Concepts, May 8, 2013; http://blog.naturalhealthyconcepts.com/2013/05/08/4-health-benefits-of-asparagus-and-why-your-pee-smells/., last accessed March 28, 2017. “Growing Asparagus,” Bonnie Plants; https://bonnieplants.com/growing/growing-asparagus/, last accessed March 28, 2017. “Asparagus: Planting, Growing, and Harvesting Asparagus,” The Old Farmer’s Almanac; http://www.almanac.com/plant/asparagus, last accessed March 28, 2017. Mateljan, G., The World’s Healthiest Foods: Essential Guide for the healthiest way of eating (Seattle: George Mateljan Foundation, 2007), 120-121.